rec. Philharmonie Cologne, Symphony 3: live, November 2005; Symphony no.5: live, January 2007; Symphony 6: live, December 2007; other details not given. 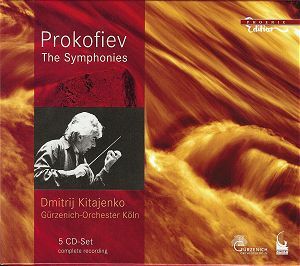 Until Gergiev’s set of live performances with the LSO appeared, the Prokofiev symphonies as a series had been nowhere near as well represented on disc as, say, those of Shostakovich or Sibelius. Now we have another fine set, by an equally distinguished Russian conductor, Dimitrij Kitajenko. Perhaps the most interesting thing about these performances is how different they are from Gergiev’s. Those readings are passionate, intense and angst-laden where appropriate; there is no shortage of those qualities in Kitajenko, but his readings are, on the whole, more measured, slightly more objective. Thus though the temperature may sometimes be a degree or two lower than in Gergiev, there can be a stronger sense of the architecture of individual works. The recordings, too, generally allow details of scoring to register with even greater clarity. Annoyingly, there is a lack of precise information about recording circumstances; the third, fifth and sixth are takes of live concerts in the Philharmonie Cologne, but the exact dates and venues of the other performances are not given. The consistent overall balance and quality of sound, however, make it probable that all were made in the Philharmonie. The Gürzenich Orchestra of Cologne has a proud and distinguished pedigree which can be traced back as far as the 15th century. On the evidence of these discs alone, it is a very fine outfit today. Individual parts are always played with character and the right degree of expressivity, while the general ensemble in these sometimes frighteningly demanding scores is always tight and controlled. So a wonderful opportunity presents itself to update one’s evaluation of Prokofiev as a symphonist. The 1st, 5th and 6th symphonies have a secure place in the repertoire; but the 2nd, 3rd and 4th are much rarer – indeed they are still virtually unknown to the average music-lover, which is extraordinary considering the eminence of their composer. I confess that I was bowled over by the power of Prokofiev’s imagination and of his creative personality as revealed by Kitajenko and his players. The 3rd Symphony in particular – composed in 1928, and based on music from the opera The Fiery Angel – is a truly stunning work which deserves far more frequent hearings. The first disc, or ‘volume’, contains the 1st and 7th symphonies. A coupling of some sort is necessary as the “Classical” is a mere 14 minutes or so, and placing it side by side with the 7th makes a lot of sense. After that, the symphonies run in sequence, with the two versions of the 4th – the original of 1930 and the revised version of 1947 – side by side on Volume 3. At present, the five discs are not available separately, but it is to be hoped that eventually they will become so. Kitajenko’s Classical Symphony makes a sparkling aperitif to the whole set. One general point to be noted early on is that his tempi tend to be on the slow side of what we often hear; this is no bad thing, meaning for example that the finale of the Classical fizzes delightfully without pushing the players too close to the edge of the possible (as happens in Gergiev’s reading). I did wonder at the beginning of the Larghetto if this was too much of a good thing, for the music seemed to ‘plod’. I soon got over that, and fell in with the conductor’s relaxed approach, relishing the utter precision of the high violins and the subtle pointing of accents in woodwind and horns. The Gavotte, too, is beautifully done, with a throw-away ending that leaves you straining to hear the last two notes – don’t worry, though, they are there! The 7th, continuing on the same disc, is naturally quite a different kettle of fish. Written at the very end of the composer’s life, it is a strange work; it has none of the aggression of his early music, or even of its immediate predecessor, the 6th . This owing to Prokofiev’s fragile health and to the political trouble he had got into with the 6th. It has, on the other hand, many of the hallmarks of Prokofiev’s mature style – great, broad melodies, brilliant orchestration, wit and fantasy. Indeed the first movement’s second theme is one of the composer’s most magnificent, ranging through more than two octaves in just a few bars. Yet when this heroic statement reappears in the coda of the finale, there is no sense of true symphonic peroration; it almost seems as if the melody reappears for no better reason than, well, it’s a good one and Prokofiev thinks we might like to hear it again. OK, I exaggerate, and the quiet conclusion that follows is admittedly haunting and equivocal, but the symphony doesn’t grapple with great issues as do the others from the second onwards. That said, the 7th is full of charming and irresistibly melodious music, which Kitajenko explores with subtlety and style, though his predilection for slower tempi does disappoint in places – the first movement needs to get moving in its more agitato passages, and the opening of the Waltz is too drowsy here for my taste too, though it does wake up later on. This is probably the least convincing of the conductor’s interpretations, though, in fairness, the work itself is somewhat recalcitrant. No such reservations with Volume 2, in which we come face to face with the Prokofiev of the 1920s: a wild, iconoclastic figure, who was struggling both to find his own voice and to give vent to the tensions he felt within himself. These were his years of self-imposed exile from the Soviet Union, and the music of this time undoubtedly shows a huge range of influences. The 2nd Symphony of 1925 has a strange two-movement structure; a lengthy first movement followed by a 25-minute set of variations. The opening Allegro ben articulato is breathless, panicky, with motoric ostinati which remind one sometimes of the Rite of Spring, sometimes of Honegger’s Pacific 231 – both works that Prokofiev encountered at this time in his career. The gently Dorian theme of the second movement comes as a relief – to the nerves and the ear – after the excesses of the Allegro. The variations are unfailingly inventive, and culminate in a remarkable final variation, which begins as a bizarre funeral march, with a Mahlerian feel. The first performance of the Second was a disappointment, not only to musicians and audiences, but more importantly to the composer himself, who in his contemporary writings is to be found – for the first and probably only time in his creative life – doubting his own creative talent. He should not have worried; the first movement, however, does have a feeling of ‘trying too hard’, though fortunately, in the Variations, the stress is relieved by Prokofiev’s characteristic humour and imagination. It seems that in the 3rd Symphony Prokofiev truly found his way forward, and this to me was the big discovery of this set, for it was not a work I had previously thought much of. How wrong I was, because this is a genuine masterpiece of the highest order. Right from the churning major/minor repetitions of the opening, we are drawn into an immense symphonic drama, with episodes of widely disparate character, which are yet held together by powerful creative control. I was struck by an astonishing passage in the first movement, Moderato, (track 9, 8:25 to 13:00); the main theme, a fine, broad melody typical of Prokofiev, soars on high, while down below, heavy brass and percussion seem intent on destroying its supremacy. And indeed, after some massive organ-like chords, the music collapses into a grotesque military march - more Mahlerian memories - which in turn is succeeded by a moment of intense poetry, where the piccolo quietly takes up the broad theme. The scoring throughout all of this is miraculously imaginative and perfectly judged, showing how hard Prokofiev had been working to perfect this part of his technical armoury. The three remaining movements sustain the first’s high level of inspiration, and the work draws an interpretation from Kitajenko and his players that is simply masterly. It was an excellent idea of Phoenix Edition’s to place the two versions of Symphony no.4 – the original of 1930 and the revision of 1947 – side by side on the third disc of this set. It’s going too far to say that the revised version is a completely different work, yet it is no mere ‘tidying up exercise’, and the divergences are considerable. The main material of each movement remains the same, but the older Prokofiev seems to have felt that the work was too perfunctory, not weighty enough. As a result, he expanded introductions and codas, and, particularly in the first movement, subjected the themes to more detailed development. The result is, naturally, a longer work, but also a more spacious one, that surely points the way forward to the 5th and 6th Symphonies. Which version do I prefer? It’s tempting to back Prokofiev’s first thoughts, but the broader perspectives of the revision give him space for some characteristically magical moments, such as the breath-taking harmonies at the conclusion of the 3rd movement (track 7, 5:25 to the end). Disc 4 is occupied entirely by Symphony no.5 in B flat, the best-known and most often performed of these symphonies, other than the Classical. Now the ‘received’ opinion is that the 5th and 6th are Prokofiev’s greatest symphonies; it is no disrespect to those works to say that listening to this set has forced me to challenge that notion. The 5th is a fine work, but is it really any greater than the 3rd, for example, which seems equally personal and strikingly original? In the end, this question probably doesn’t matter that much, beyond emphasising once more that a reassessment of Prokofiev the symphonist is long overdue. Well, I wrote the previous paragraph before listening for a second time to Kitajenko’s 5th – and what a piece it is! The conductor underlines its epic nature with his steady tempo for the 1st movement, taking the indication Andante very seriously, and not pressing forward at all – until the more easy-going second theme is reached (track 1, 2:48). He keeps a firm, disciplined hold on both tempo and structure, and the result is hugely impressive. In the central development section, with the second subject transformed from its initial amicable nature into a striding giant, the music builds to a glorious climax, and the recap of the main theme comes in on the crest of the wave of energy thus generated. This is great music-making, bracing and satisfying at the same time. The middle movements fare equally well, being strongly characterised and meticulously balanced in all details. Again, Kitajenko avoids the trap of taking a headlong tempo for the scherzo, for it is simply marked Allegro marcato (fast and rhythmically marked), not prestissimo as we often hear. The more measured speed allows for the accelerator pedal to be pressed to the floor in the concluding pages, to thrilling effect. The wonderful Adagio achieves both grandeur and a rapt moonlit intimacy in its closing pages – surely the composer at the peak of his powers. The emotional temperature is turned down at the start of the finale, until that crazy clarinet theme initiates an eventful and entertaining rondo. But there is a sting in the tail; listen closely to the final bars, where a distinctly sinister mood overtakes the music, before the final surge and crash. That sinister mood is perhaps the starting point for the 6th – for my money Prokofiev’s finest purely instrumental work, and a strong candidate for that much-coveted (and never to be awarded!) prize, ‘Greatest Twentieth-Century Symphony’. The 5th had been completed in the immediate relief and exhilaration following the conclusion of World War 2. After some reflection, Prokofiev set about chronicling in his next symphony the individual human tragedies of that conflict; he said that “each of us has wounds that cannot be healed. One of us has lost people dear to him; another has lost his health”. The pain keeps breaking out in the music, and is at times almost unbearable, as at the end of the development of the first movement, where horns groan and cry out in agony at the violence that has led up to this moment (track 1, 9:55 to 11:10). And the final pay-off comes in the finale; the forced jokiness of the earlier part of the movement gives way to a scene of devastation and horror before the convulsive ending. Again, Kitajenko, without exaggerating or sensationalising, is equal to every interpretative challenge of this amazing score. This set surely takes up a distinguished position in the recordings of this great twentieth century figure’s music. It is a superb musical and technical collaboration, and one which I know I shall return to again and again with the deepest pleasure.